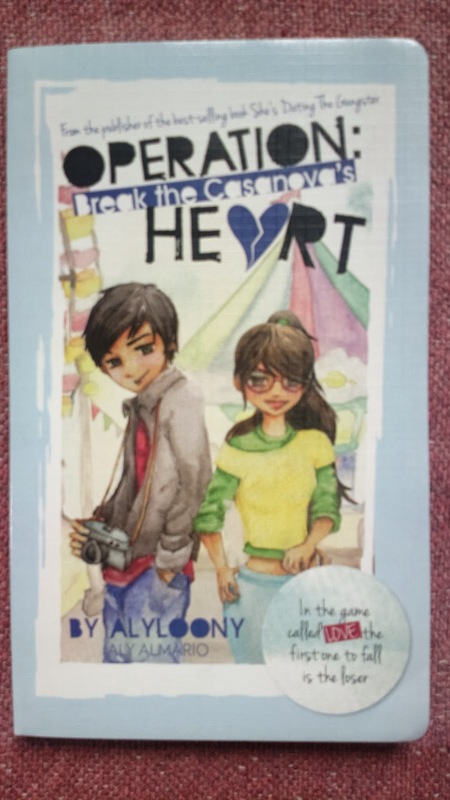 In Operation: Break the Casanova’s Heart by Alyloony or Aly Almario, the mission was both a success and a failure for Naomi Mikael Perez because she followed each of the steps to heart and succeeded except for one important reminder she agreed upon prior to her sealing the contract, she must not fall in love with Stephen Cruz because she did. Step 1. Make him notice you. Step 2. Differentiate yourself from other girls. Step 3. Get an invite for a date. Step 4. Make the said date memorable. Step 5. Make him take you seriously. Step 6. Ensure that he’s dating you exclusively. Step 7. Snag an invite to meet his parents. Step 8. Get a kiss – a sincere one. Step 9. Be the best girlfriend he’s ever had. Final Step. Break his heart. 1. Make him notice you. 2. Do something for him that no other girl has ever done. 3. Make him ask you out on a date. 4. Make sure that said date is memorable. 5. Make him take you seriously. 6. Ensure that he dates no other girl but you. 7. Get him to introduce you to his parents. 8. Make him kiss you. The only rule which must not be broken this time is to never break his heart. But prior to the well deserved happy ending, their relationship was topsy-turvy. It all started when Naomi’s best friend Kryzel was dumped by the school’s resident Casanova. She was amongst the long list of countless other ex-girlfriends. It took a toll on Kryzel that Naomi had to do something for her friend, even sign the supposed contract above from an organization with members who hated Stephen for his act. But it turns out that the supposed contract was meant to protect him. His pretend past girlfriend of 18 months, Yanie wanted to protect him from 3 heartbroken girls who had connections with gangsters and wanted to kill him. The only way to spare his life was if he becomes heartbroken too over someone he loves. Apparently, he had been in love with boyish nerd Naomi since high school and didn’t notice it but Yanie did so she knew Naomi was the perfect agent for the mission above. The Casanova sort of followed his dad’s footsteps. His dad started fooling around after his wife left him when Stephen was 7. Father and son tag team had lost respect for women ever since then although his dad at least recovered when he met someone to love. What a twist of fate because it turns out that Anne, Nami’s stepmother for years is actually Stephen’s mom. Anne’s family was indebted to Steven’s (Stephen’s dad) family and so she was forced to marry him in return for the financial favor. But she was in love with the driver, Naomi’s dad who in turn married Nerissa, the maid instead. Steve became resentful of Anne upon learning about the truth and she was forced to leave him when she started physically abusing her. Being broke, she couldn’t bring Stephen and wasn’t even allowed to see him after she left. She met Nami’s dad again afterwards and learned that he became a widower. They soon married. I’ve pretty much outlined the entire storyline now so I better stop before I summarized the entire plot. :) But this is only the tip of the iceberg so they say and I’ve only written about the dramatized part. Wait till you read the seemingly cheesy but romantic moments between Nami and Stephen including everyone who had a role to play in unfolding their story together. Find out about Kryzel, Yanie, France, Drew, Rence and Nami’s brothers particularly Nico (the model) when you read the book. I was so relieved that despite that hit and run incident where Nami fell into a coma, the ending is not heart breaking unlike the previous Summit Books novel I read, She’s Dating the Gangster. This book from Pop Fiction is worth reading. It’s also in English and was written by a barista. I too love coffee but my cup turned cold while reading this book. I couldn’t stop reading, not even for my beloved coffee. 10 stars for Operation: Break the Casanova’s Heart! "I too love coffee but my cup turned cold while reading this book. I couldn’t stop reading, not even for my beloved coffee." Hahaha this was funny! I hope that this will be a movie somedaaay!! To be honest, the contract thing was pree unique for me (probably cuz like I said, 1st story I've read in Wattpad. Haha) but the shocker part is why the contract was made, huh? I got sad about Anne's story here T________T then I got sadder knowing Stephen and Naomi were actually stepsiblings,technically. ^True. Although there was another Wattpad based published book I've read that's a bit similar. It's called The Bet and the romance sprung from a bet with a sort of hidden agenda from the plotter to bring the couples together. As for OBTCH, yep. Anne's story was heartbreaking but all's well that end's well and Naomi helped a lot towards Stephen's family's healing.